← Did I Tell You How Much I Love My Bed? 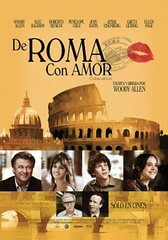 We watched Woody Allen’s recent film, “To Rome With Love,” with some good friends a few weekends ago. 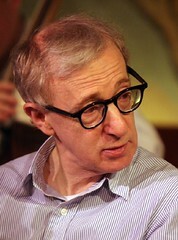 We’re Woody Allen fans and as far as we’re concerned, he could do no wrong. The movie critics were quite harsh with him this time. He garnered a paltry 56 out of 100 Metascore, according to popular polls. Even fan reviews were lukewarm and at times, scathing. However, Tweets about the movie have an 86% approval rating. Go figure! I first noticed Mr. Allen’s films when I watched Annie Hall, which went on to win several Academy Awards. I was living in Manila then and just out of high school. I thoroughly enjoyed the movie. I loved his insecure, self-deprecating worry-wort character who seems to be in perpetual self-analysis. It’s as though his everyday life in New York was a giant analyst’s couch. I learned about Jewish angst, how Manhattanites lived, and for some reason, the man always makes me laugh! Or marvel! I was hooked. I would look forward to his subsequent films. It’s hard to choose which is his best work. I could watch some of his films over and over again and still find something new to laugh with or find very clever. Just at the top of my head, there’s Radio Days (about life when it was just the radio), Hannah and her Sisters, Bullets Over Broadway, Small Time Crooks, Mighty Aphrodite (with the Greek tragedy chorus on the side—clever! ), Crimes and Misdemeanors, Purple Rose of Cairo, Zelig, Stardust Memories, Match Point. More recently, there was Vicky Christina Barcelona, then You Will Meet a Tall Dark Stranger, then Midnight in Paris, which garnered quite a few nominations and success at the box office. And then there’s To Rome with Love. I thoroughly enjoyed this movie. I don’t care what these Rotten Tomatoes have to say. It had four vignettes, which were not necessarily related to each other but just seemed to meld somehow, being set on the streets of Rome. I found that Mr. Allen, to make his point about say, celebrity, pulled a very ordinary Joe like Roberto Benigni‘s character, a mere clerk, wakes up one morning to celebrity-hood, for some unknown reason, even to him! Then there’s the soon to be father-in-law who can only sing beautifully in the shower played by Fabio Amiliato, who happens to be a very talented tenor. Woody’s character, a retired opera director on a warpath with mortality, convinces him to perform on stage—in a shower! The movie swings from romantic comedy to a satire. A clever one at that. I can’t help but wonder if the fact that there seemed to be more subtitled dialogue (in Italian) contributed to the lowered ratings. I noticed the same with the film, The American. The latter was mostly in Italian. The filming and development of the story was very European. Less said. More suggestive glances or camera panning. Perhaps. This entry was posted in Midnight in Paris, Movies, To Rome with Love, Woody Allen and tagged postaweek2011, Postaweek2012, Roberto Benigni, Small Time Crooks, Stardust Memories, To Rome With Love, Vicky Cristina Barcelona, Woody Allen. Bookmark the permalink. I adore Woody Allen. He’s like me in some ways, only I don’t pull the worried faces! I agree — Rotten Tomatoes isn’t always right!